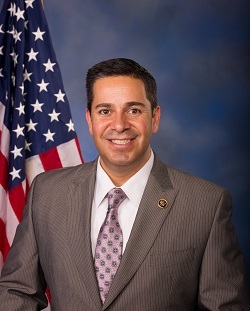 U.S. Representative Ben Ray Luján (D-NM) will address the Next Generation Water Summit on Friday, June 14th in Santa Fe, NM. Congressman Luján’s keynote address will begin at 8:15 am in the Santa Fe Community Convention Center. Congressman Luján began serving in the U.S. Congress as a Representative from New Mexico in 2008. Congressman Luján has worked to create good-paying jobs in New Mexico, increase access to affordable, quality health care, protect New Mexico’s natural resources, build a clean energy economy, and restore checks and balances in our government. He is a member of the House Energy & Commerce Committee, sitting on the Health Subcommittee, Consumer Protection & Commerce Subcommittee, and the Communications & Technology Subcommittee. Luján is a long-time advocate for New Mexico’s acequias and traditional lands. He continually works to ensure adequate funding for these cultural assets through both the legislation he has authored and through the Farm Bill. He also supports rural farming and ranching by securing grants to help food-producing communities advance entrepreneurship. “One of my earliest memories is helping tend the acequia on my family’s small farm in Nambé, and I know that water is one of our most precious resources in both New Mexico and in the West. I introduced the Acequia Conservation Program Eligibility Act to help ensure that water conservation is a chief goal as we live, work, and plan for our communities’ futures. I am encouraged that we are holding the Next Generation Water Summit in Santa Fe to work on the solutions that are necessary for our survival,” Rep. Luján recently stated. Congressman Luján’s Friday keynote address will be free to attend. Registration is requested, however, and can be done at www.NextGenerationWaterSummit.com. Attendees who are only interested in hearing his address are encouraged to choose the Friday-only (No CEUs) option. Experts scheduled to present June 12th – 13th during the Summit include: Dr. Rolston St. Hilaire, Professor & Department Head at New Mexico State University; Dr. Nirit Bernstein of the Israeli Institute of Soil, Water and Environmental Sciences; Kyle Pickett, Co-Founder & COO, Urban Fabrick, Inc.; and Bill Hoffman of H.W. Hoffman & Associates. June 14th will be New Mexico Day, and includes a raffle of a 200 gallon rainbarrel, kids’ fun events, a tour of Santa Fe Community College’s new greenhouse facility, a “Careers in Water” track, and many how-to workshops. For more information on the rest of the Summit, please visit www.NextGenerationWaterSummit.com. Hosts of the Next Generation Water Summit will be the Santa Fe Green Chamber of Commerce; Green Builder® Coalition; City of Santa Fe; KUELWater; the Alliance for Water Efficiency, and the Santa Fe Area Home Builders Association. Major sponsors include Turner Foundation and Phyn. Santa Fe Community College is the official education sponsor, and Green Builder® Media is the national media partner. The Next Generation Water Summit is pleased to announce a very broad range of pre-and post-Summit water workshops. Several of the workshops will start prior to the Summit on June 5th and continue after the Summit through June 25th. The workshops include: Greywater Basics, Water Efficiency Rating Score (WERS)® Verifier and Consultant training, Commercial Water Auditor Training, Hotel Water Audits, QWEL Landscape training, and several others. This is the first time several of these courses will be presented in New Mexico and are open to professionals and students. The Commercial Restaurant Water Auditor class, held June 7th and June 10th, is the first of its kind anywhere in the country. This class is being taught by Bill Hoffman, and those who attend and successfully pass the test will become a Commercial Restaurant Water Auditor. The City of Santa Fe Water Conservation Office will assist in the recruitment of restaurants to be audited and will use the auditors that successfully complete this workshop. A test and a sample audit will be performed as part of the class. 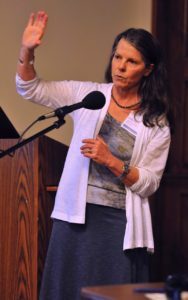 “The Summit always represents an educational opportunity for those interested in a water career,” stated Christine Chavez, Manager of the Water Conservation Office for the City of Santa Fe. “This year we are especially excited to see the rollout of our Commercial Restaurant Audit Program. Saving water is always important in Santa Fe, and this class expands our conservation programs into the commercial restaurant sector. We will support this program with rebates and promotions to hopefully audit over 200 restaurants during the next 12-18 months,” she concluded. The Water Efficiency Rating Score (WERS)® Verifier course, occurring June 5th through the 7th, provides in-depth and practical experience in performing residential water assessments for new and existing residential properties. This class is required to become a WERS Verifier. The WERS Consultant course, held concurrently on June 5th and 6th, is also being offered and plumbers, builders, irrigation professionals and water reuse professionals are eligible to attend this professional designation course. Greywater Basics, scheduled for June 24th and 25th, will cover how to build and maintain a Greywater system and includes a field trip to view a working system. This course is intended for both plumbers and homeowners. The Hotel Audit class will also be instructed by Bill Hoffman and will follow the Restaurant Audit class. It will focus on appliances and water-features not included in the restaurant workshop (e.g. cooling towers, laundry facilities, swimming pools and spas, etc.). This class will be held June 11th. The Qualified Water Efficient Landscaper (QWEL) professional certification provides landscape professionals and others education on local water supply, sustainable landscaping, soils, landscape water budgets, irrigation system components and maintenance, irrigation system audits, and scheduling and controller programming. An audit and an exam is included in this class. This class is scheduled for June 17th – 21st. “Water workshops and water certification courses are part of the Next Generation Water Summit every year, and this year we have the broadest array of workshops we have ever had,” stated Doug Pushard, co-chair of this year’s Summit. The ability to earn valuable Continuing Education Credits or new water certifications is an important part of the mission of the NGWS. Detailed information about these workshops can be found at: www.NextGenerationWaterSummit.com. Hosts of the Next Generation Water Summit are the Santa Fe Green Chamber of Commerce, Green Builder® Coalition, City of Santa Fe, the Alliance for Water Efficiency and the Santa Fe Area Home Builders Association. Santa Fe Community College is the official education sponsor, and Green Builder® Media is the national media partner. The Next Generation Water Summit always looks to provide innovative content, and 2019 is no exception. The final day of the Summit will feature a “Careers in Water” track aimed at students preparing to embark on their careers, as well as others who might be seeking a career change. The Summit will take place June 12-14 in Santa Fe, NM. Friday’s career track will also feature sessions on various facets of the water industry that are applicable to projects big and small, including water certifications, alternative water, irrigation and landscape. “We’re really excited to offer content that is relevant to today’s students, but we also hope they take the opportunity to network with some of the most prominent leaders in the industry,” said Doug Pushard, co-Chair, 2019 NGWS and co-founder of KUELWater. They are scheduled to present on a diverse range of topics, from forest restoration to commercial water sharing to water reuse in Israel. The Summit is a unique water and water reuse event that will feature builders presenting on Net Zero Water Houses and Near Net Zero Water houses. 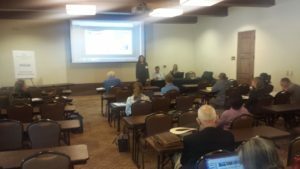 These Southwestern builders will host a design workshop for builders, contractors, home owners or architects that need assistance in designing net zero water dwellings. Prospective attendees will not want to delay registering for this outstanding event, as capacity is limited. Early bird registration is available now through March 22 at the special rate of $249, so people are encouraged to register now. For more information on the Summit, please visit www.NextGenerationWaterSummit.com. Hosts of the Next Generation Water Summit will be the Santa Fe Green Chamber of Commerce; Green Builder® Coalition; City of Santa Fe; the Alliance for Water Efficiency, KUELWater, and the Santa Fe Area Home Builders Association. Santa Fe Community College is the official education sponsor, and Green Builder® Media is the national media partner. Early bird registration is open for the 3rd Annual Next Generation Water Summit (NGWS) to be held on June 12th – 14th, 2019 in Santa Fe, NM. “Water Reuse Trends” by Kyle Pickett, Co-founder & COO of Urban Fabrick, Inc. Prospective attendees will not want to delay registering for this rare opportunity, as seats are limited. Early bird registration is available now through January 15 at the special rate of $200. Hosts of the Next Generation Water Summit will be the Santa Fe Green Chamber of Commerce; Green Builder® Coalition; City of Santa Fe; the Alliance for Water Efficiency, KUELwater, and the Santa Fe Area Home Builders Association. For a first-time event, the inaugural Next Generation Water Summit was considered by many to be a huge success. 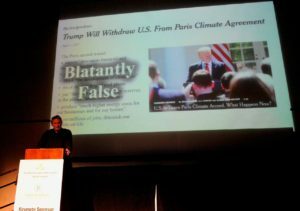 A total of 138 people registered for the event, which took place over the course of 3 days in early June at the Santa Fe Convention Center in Santa Fe, NM. Attendees could choose from 39 sessions, many of which were grouped into one of three tracks: Builders, Developers & Architects; Water Professionals; and Policy. 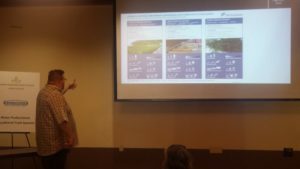 Topics ranged from rainwater, greywater, blackwater, stormwater, water rights, irrigation, water efficiency, building codes, land use and leak detection. The first day of the event was a Sunday, and was free for anyone to attend. 12 sessions were offered, in addition to the myriad of exhibitor booths one could visit in the Green Expo, hosted by the Santa Fe Green Chamber of Commerce. On Monday, Ed Mazria delivered a rousing keynote that had attendee Michelle Maddaus saying, “That was the best keynote I have ever seen, and I have seen a ton of keynotes over the years! Everyone kept talking about it, too.” Not to be outdone, Mary Ann Dickinson gave an excellent keynote on Tuesday morning, getting everyone focused on solutions for the challenges ahead. Christine Chavez, Neal Shapiro and Regina Hirsch head up a panel session on Monday, June 5, 2017. 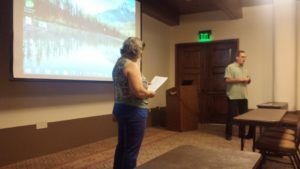 Hosts of the event were the Santa Fe Green Chamber of Commerce (lead host), Green Builder® Coalition, City of Santa Fe, and the Santa Fe Area Home Builders Association. Santa Fe Community College was the official education sponsor, and Green Builder® Media was the national media partner. Vulcan, Inc. was a Sustaining Sponsor; Uponor, Evolve Technologies and Aquamate were the Educational Track Sponsors; Horizons Sustainable Financial Services was the Mayor’s Reception sponsor; Niagara Conservation was the Keynote Sponsor; Santa Fe County was the Networking Tables Sponsor and Environmental Services was the Bag Sponsor. To view the entire schedule, please click here. To learn more about the presenters, please visit the presenter page. Finally, if you’re looking for even more learning opportunities, Santa Fe Community College will be hosting 3 Pre-Summit courses. Early bird registration has officially opened for the Next Generation Water Summit. Through March 31st, attendees can register to attend the Summit for $249. This will allow admittance to any Sunday, Monday and Tuesday session, regardless of track. Just as important, attendees will be able to network with a broad spectrum of stakeholders while working towards solutions for their respective challenges. 10’ x 10’ exhibit booths are available starting at just $499! Sponsorships start as low as $500. Full event information is available on the Summit website. The overarching theme of the event will be how to sustain the building/development industry in western states with declining water resources, even as the next decade experiences surging growth from retiring Baby Boomers. The first day (Sunday) will have a Green Expo at the Convention Center, with local experts presenting seminars in the break-out rooms. Three educational tracks, targeting Builders & Designers, Policymakers, and Water Conservation Experts, will span three days. There will be 12 sessions on Sunday afternoon, followed by a full slate on Monday & Tuesday. Keynote speakers will open Monday & Tuesday’s proceedings. Pre-conference courses, including QWEL training, ARCSA AP training and WERS® Verifier training, are scheduled. Santa Fe will host the inaugural Next Generation Water Summit on June 4-6, 2017. This first-of-its-kind, national event will feature three educational tracks, two keynote speakers and an expo. The Summit will begin with the Green Expo, an exhibition presented by the Santa Fe Green Chamber of Commerce. All events will take place at the Santa Fe Community Convention Center. Pre-Summit courses will include a Water Efficiency Rating Score (WERS®) Verifier course, an ARCSA Rainwater Harvesting AP course, a 2-day Greywater course and a Qualified Water Efficient Landscaper (QWEL) course. All will be held at nearby Santa Fe Community College. The Summit will be the first event to offer continuing education for those trained in either the WERS Program or WaterSense for Homes.